1. 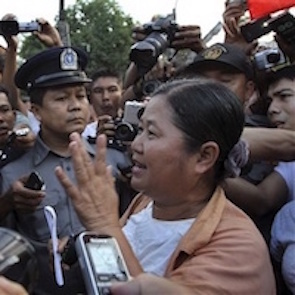 The situation for human rights defenders (HRDs) in Myanmar has improved due to the political reforms that have taken place in the country since 2011, but serious challenges remain. Although more than 1000 political prisoners, including many HRDs were freed, a number of conditions were attached to their release and they could be returned to prison once again should they be accused of similar offences. Furthermore, their release was not accompanied by measures to support their reintegration into society. As a result, many of them face discrimination and have difficulty finding work. 2. Former imprisoned HRDs have faced a number of restrictions. Student activists who had served jail terms were not allowed to return to study at their universities, in an apparent attempt to prevent them from organising other students on human rights and political-related issues. Many of them were warned to refrain from any form of human rights activism. 3. Prominent HRDs are not able to obtain passports. The Ministry of Home Affairs has refused to issue passports to former political prisoners, in a move that appears to be aimed at curbing their human rights work internationally. 4. Further to the opening of the country and the arrival of foreign companies, land confiscation has increased, along with threats against HRDs working in the field of economic, social, and cultural rights. The criminalisation of legitimate and peaceful protests by communities affected by development projects is of concern, as well as judicial harassment against HRDs who work to support them. Farmers and land rights defenders have been harassed, arbitrarily detained, and in some cases killed for challenging land confiscation. 5. The violence against the stateless Rohingya in Arakan state and the Muslim population, which erupted in 2012, made it more difficult for Rohingya and Muslim HRDs to work freely. Community leaders working to promote interfaith dialogue and documenting human rights violations faced arrest and charges and were held in pre-trial detention. HRDs working to protect the rights of the Rohingya population are afraid to speak up publicly for fear of persecution as well as of being sidelined within the human rights community. 6. The government has introduced several pieces of legislation that, ostensibly, allow fundamental freedoms of association, expression and assembly. However, these laws provide for restrictions on the exercise of those rights and are in practice used to stifle the work of human right defenders. A case in point is the 2011 Peaceful Assembly and Peaceful Procession Act. The law contains stipulations such as the need to apply for permission to assemble, later amended to ‘consent’ from the authorities. This consent must be applied for five days in advance, with details of the time, place, and slogans, and purpose of the assembly, as well as names and addresses of the organisers. Those who contravene the legislation are criminally liable under Section 18. A number of HRDs have been charged for violations of this law. 7. The Government also enacted the Association Registration Law in 2014, permitting civil society organizations to work officially in Myanmar. However, the legislation contains vaguely worded clauses (e.g. references to organisations which threaten “national security” or being subject to charges under “existing law”) or clauses which have the potential to restrict the freedom of associations to operate (e.g. imposing limitations on the geographical scope of their activities). 8. Furthermore, several dated pieces of legislation remain in force, which continue to be used to arrest political opponents and HRDs, including the 1908 Unlawful Association Law and provisions of the 1861 Penal Code. 9. A worrying trend is the intimidation of journalists who are covering events the authorities do not want to be in the public domain. A case in point is Aung Kyaw Naing (popularly known as Ko Par Gyi), a journalist who in 2014 was taken into custody, tortured and shot dead by the Army. His body was buried without being returned to his family (see paragraph 19). 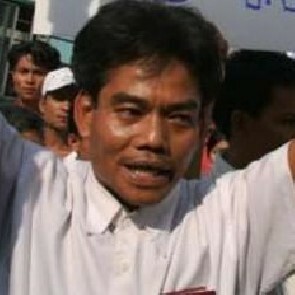 Par Gyi’s death has caused widespread outcry amongst civil society in Myanmar. Another high profile case is that of five journalists of newspaper Unity Journal, who were sentenced to ten years imprisonment with hard labour in July 2014, for reporting the existence of an alleged chemical weapons factory. i) Ratify and ensure full respect of the International Covenant on Civil and Political Rights and the UN Declaration on Human Rights Defenders, including in particular the right to freedom of expression, association and assembly.